This revival of Edward Albee’s masterwork is perhaps the most lucid and clear production of the play I’ve ever seen, and I’m ambivalent about that. Don’t get me wrong, this is a very accomplished production of a great play, with exceptionally intelligent acting and directing choices. I enjoyed it a great deal, and think it’s definitely worth seeing. It’s just that, upon reflection, it’s not totally to my own personal taste. Who’s Afraid of Virginia Woolf is set on the campus of a small New England college in the early 1960s, a milieu so boozy that it makes Mad Men look like an Alcoholics Anonymous meeting. Middle-aged history professor George and his loving yet vicious wife Martha invite a young new professor and his wife home for a nightcap, and the psychological damage mounts as the bottles rapidly empty. I grew up in an academic family, and the stories I heard of 1960s faculty parties were particularly hair-raising. Perhaps this production doesn’t feel messy enough to have the texture of reality for me. Or perhaps it’s too realistic for me. Albee was very influenced by both the French Absurdists and Tennessee Williams. As someone who’s been reading and directing a lot of Jean Genet and late period Williams, I miss the willful sense of unreality and distortion that has made for Woolfs that I liked better than this one. Again, not a big problem, but it kept this fan of Surrealism from enjoying it as much as he might have. 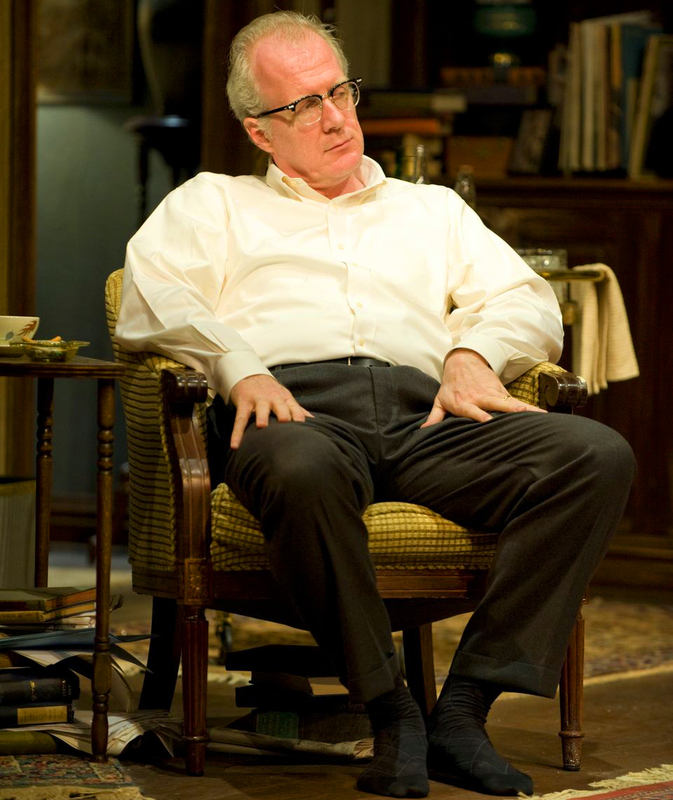 Tracy Letts’s masterful portrayal of George is the one irreproachably strong thing about this production. Here is a great actor who also happens to be a great and sensitive playwright, and we can see in a very direct way how this play leads to Lett’s own August: Osage County. In any event, this Woolf demands to be seen on its own terms. If you are a fan of mainstream realism, this is really one of the better examples of that approach out there.